Yashiki Resort is an album by GiMGiGaM that was released on the label Mayoware Record in 2016. This album is a few genres but mostly instrumental soft rock stuff and ambient. This is an awesome and relaxing album. This album definetely has some tracks that have a vaporwave sound to them, but this album is vaporwave. Very vaporwave-esque melodies/percussion/rhythm, heck there’s even some saxophone. The first two tracks are the most vaporwave-esque. The album then takes on a much more acoustic and ambient sound. Pretty acoustic guitar, ambient effects, ocean sounds, these ones are really calming. There’s a random dance track thrown in with these, then it closes with a jazz track. There’s also tropical vibes in some of the tracks. 秋空トリップ is an EP by Caro kissa that was released on Mayoware Record in 2013. The genre for this is J-indie rock/J-pop. This EP has a nice happy vibe. Two of the songs have vocals and there’s also an instrumental track. The vocal tracks have a female vocalist and summery melodies. The tracks are upbeat with lots of acoustic guitar. They also sound very J-pop like and carry that vibe much than they do the rock vibes. The instrumental track is much slower than the other tracks and sounds like Harvest Moon with a hip-hop beat so its pretty relaxing/cool. 님을 위한 노래 / 마음 is an album by 오정선 that was released in 1978 on SRB Records. The genre for this is K-pop, but it carries elements from some other genres, most noticeably enka, rock, and folk/country. This album is very slow and downtempo. The melodies, her vocals, and the vibe of the album sounds melancholic or / emotional. Slow drums, slow vocals, and lots of slow bass, guitar, and strings helping build the feel. Some songs do pick up in tempo and/or sound happier than the rest of the album, not all of it sounds sad. PH is an EP by Niagara that was self-released in 2013. This EP is rock. This EP has a really nice vibe to it, very calming. Pretty melodies done by guitar and synthesizers. The vocals go with the rest of the music very well and definitely helps push the feel of the release. The album also has some nice lo-fi stuff going on. This is a really nice EP, I wish they would put out more stuff. 天界のペルソナis an album by Shizuka released in 1994 on P.S.F. Records. The genre for this is psychedelic rock. The album starts off fast and chaotic but don’t let that mislead you, the album is on the slow side. Very slow guitar accompanied by also slow very gothic female vocals. The whole album has a gothic feel/vibe/aesthetic to it. The percussion is almost always on the minimal side, just adding another layer to the atmosphere of the album. Melodies sound like they’re caught between somewhat happy to sad; bittersweet maybe. Also, since this is psychedelic rock there are some guitar solos, I’m not a huge fan of guitar solos but they do it well and sound enjoyable. 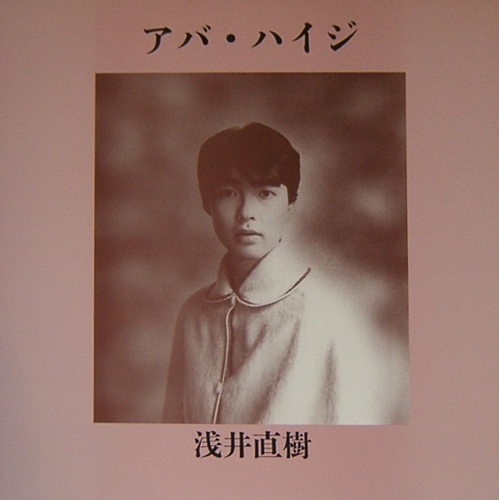 アバ・ハイジ is an album by 浅井直樹 (Naoki Asai) on the label Chesire Records in 1988. Actually discovered this one a few hours ago. This album is some rock stuff (I’m not good with rock sub-genres so yeah), it has a pretty chill sound even during the upbeat moments. It sounds nice and summery, good music if you have a long drive during the day in the summer heat. This album is pretty soft as well, not a “let’s rock out!” type of rock album. Also everything sounds like it has some slight reverb on it which I love. Good melodies and good music~!